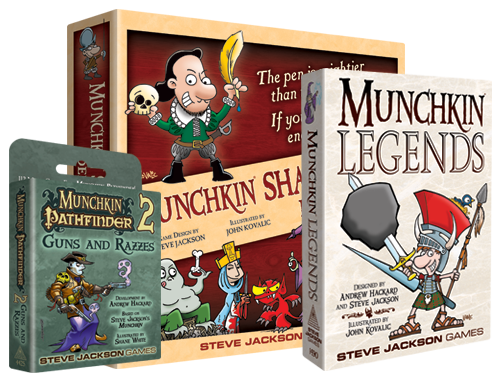 Our hottest game for the last decade has been Munchkin. Go down in the dungeon. Kill everything you see. Take all the treasure. Backstab your friends and steal their stuff. First one to Level 10 wins! Whatever your favorite style of game is – science fiction, zombies (with you as the zombies! 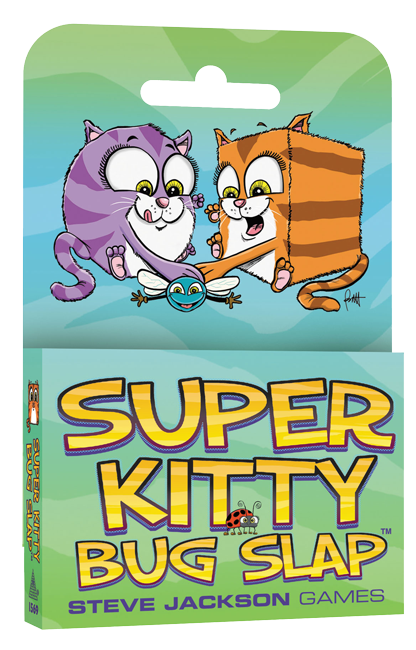 ), Lovecraftian horror, or end-of-the-world adventure – there's probably a Munchkin set to support it! 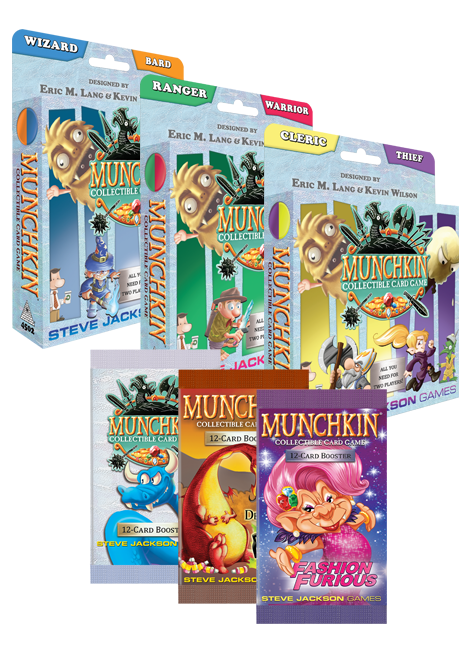 Check the Munchkin Games page to stay up to date on all our Munchkin releases! The Munchkin Collectible Card Game is a head-to-head duel full of playful illustrations and Munchkin-style jokes where you bluff and cheat to win! Pick the Human Wizard, Orc Bard, Centaur Warrior, Halfling Ranger, Elf Thief, or Dwarf Cleric and fight your opponent until they are out of options or vanquished. Gather loot, send monsters after your enemy, and cheat with both hands – all on your way to victory! Designed by award-winning creators Eric M. Lang and Kevin Wilson. 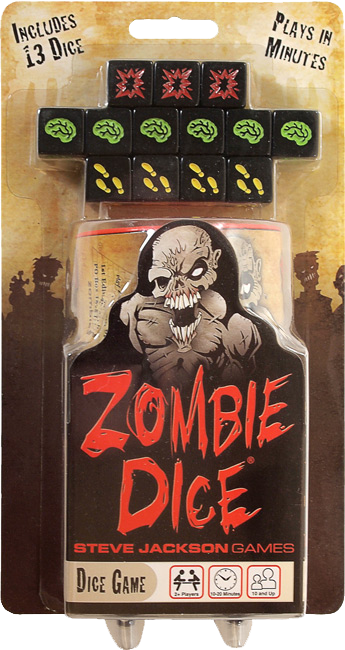 Zombie Dice is fast and easy for any zombie fan (or the whole zombie family). The 13 custom dice are your victims. Push your luck to eat their brains, but stop rolling before the shotgun blasts end your turn! The first expansion, Zombie Dice 2 – Double Feature, introduces three character dice: the Hunk, the Hottie, and Santa Claus! The second expansion, Zombie Dice 3 – School Bus, stars the big yellow "school bus" die! Zombie Dice won the Origins Award for Best Family, Party or Children's Game of 2010. 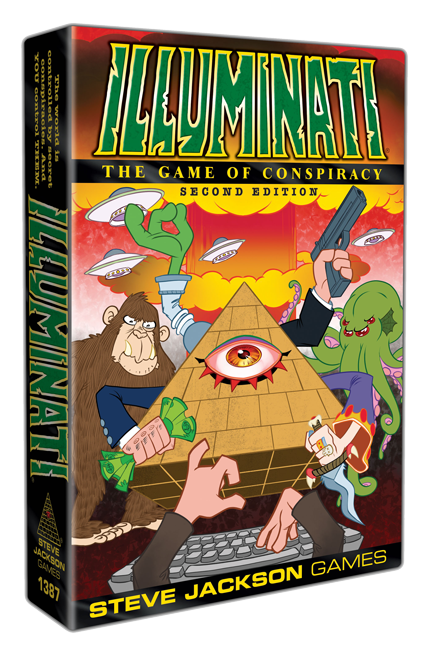 Illuminati was one of our first hot games, and it continues to be a best-seller! First released in 1982, this classic game was upgraded to the full-color deluxe version you see today. There have been four supplements – Y2K, Brainwash, Bavarian Fire Drill, and most recently, Mutual Assured Distraction – and one spin-off – Illuminati: Crime Lords. Keep Cthulhu Dice in your pocket to drive your friends mad wherever you go. 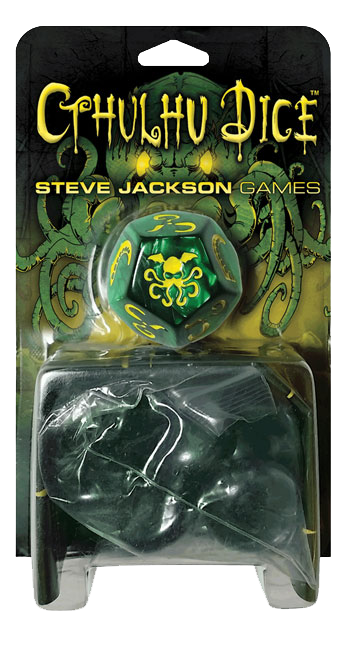 Roll the big, beautiful 12-sided die embossed with tentacles, Elder Signs, and more to destroy or steal your opponents' sanity. If everyone loses their marbles together, Cthulhu wins! 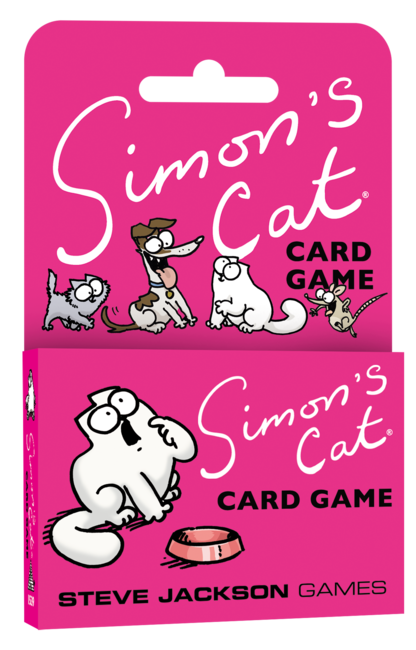 This fast-paced card game for 3 to 6 players features adorable art taken directly from animator and illustrator Simon Tofield's YouTube series, Simon's Cat, which has hundreds of millions of views. Go around the table playing cards to escape Simon's attention. Get caught and you get Blame. Get too much Blame and you get fed last. No one wants that. Play a calculating cybertank methodically annihilating everything within its path in pursuit of its goal, or try to stop it as the valiant group of defenders with Ogre Sixth Edition! 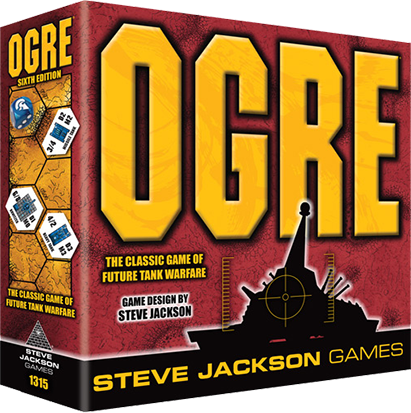 This classic game of futuristic warfare includes 3-D constructible models for the Ogres and Command Post with oversized, full-color counters for regular units. To protect your constructed models, this edition comes with a garage-style box inlay. Will the Command Post prevail this time, or will the Ogre destroy it yet again? GURPS has been the leading "universal" game system for almost three decades, and is now well into its fourth edition. You can roleplay in any background using just the GURPS Basic Set . . . but we've released in excess of 250 other GURPS Third Edition supplements, most still useful with GURPS Fourth Edition, and there are over 150 GURPS Fourth Edition titles available, with more appearing every month, thanks to both print releases and PDFs sold by our online store, Warehouse 23. GURPS continues to cover the broadest range of topics for roleplaying, anywhere! Some supplements – like GURPS Dungeon Fantasy, GURPS Horror, and GURPS Supers – tackle genres. Others present historical material: GURPS Aztecs, GURPS Greece, GURPS SEALs in Vietnam, and many more. And still others offer settings, from our own GURPS Banestorm and GURPS Infinite Worlds to licensed properties such as the Discworld and Vorkosigan roleplaying games. To support all this, we offer rules expansions like GURPS Martial Arts and GURPS Powers, and equipment and vehicle catalogs such as GURPS High-Tech, GURPS Spaceships, and GURPS Ultra-Tech. And because GURPS is one consistent rules set, from one professional publisher, all of these supplements work well together, whatever combination you pick. Buy GURPS books to play . . . or as sourcebooks for other systems . . . or just to read and enjoy.